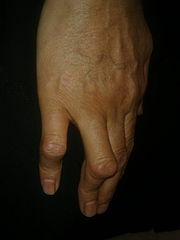 Classic boutonniere deformity of proximal interphalangeal (PIP) joint flexion and distal interphalangeal (DIP) joint hyperextension. The central tendon slip attaches to the epiphysis at the base of the middle phalanx . It extends the PIP joint. However, it is interconnected by a series of oblique fibers to the lateral bands that pass radially and ulnar to this tendon and extend the DIP joint. The central tendon slip and lateral bands do not have to be powerful. They are simply positioning elements. They put the digit into extension in order for them to be able to flex. The two systems are interconnected to each other by a series of crossing fibers so that injury to one has an effect on the other. The central tendon slip is simply an extension of the extensor tendon found on the dorsal hand. When the extensor tendon crosses the MCP joint, it is called the central tendon slip. The central tendon slip is the most powerful extender of the PIP joint. If this joint is put passively into full extension, the lateral bands will lie predominantly slightly dorsal to the axis of PIP joint rotation and will act as a weak extender of that joint. If the central tendon slip avulses from its insertion on the dorsal base of the middle phalanx, the middle phalanx will no longer lie (because of the pull of the flexor tendons) in a fully extended position, and the DIP joint will be reactively pulled into a hyperextended position. When the central tendon slip avulses, it retracts because of the natural contractility of a muscle that is no longer at its resting length. Through the remaining cross-fiber interconnections, the retracted central tendon slip now pulls on the lateral bands, causing the hyperextension of the DIP joint as the PIP joint collapses into flexion because of the unopposed pull of the flexor tendons. It is commonly caused by injury or by an inflammatory condition like rheumatoid arthritis. without central slip connection collapses into some flexion. Typically, an avulsion of the central tendon slip occurs when an objects hits the end of a digit and causes acute flexion of the PIP joint. If the blow is unexpected, the child may not be able to relax the digit quickly enough, and the central slip will be pulled from its distal insertion with or without a piece of bone attached to it. The joint will be swollen and in a deceptively slight posture of PIP joint flexion. Likewise, the distal joint will be slightly hyperextended. The PIP joint will be diffusely tender. Occasionally, one can determine that the dorsal aspect of the PIP joint is more tender than the volar surface. This might be the first clue to the injury. Second, the power of PIP joint extension will be diminished. In the younger child, distinguishing pain from actual weakness as the source of loss of extension power is difficult. An injury to the volar plate, as well as to the central tendon slip, often leads to mild to moderate contracture of the middle joint. However, in a volar plate injury, the passive excursion of the distal joint is not limited in flexion, whereas it is moderately limited in a typical boutonniere injury. Elson's Test- It is used to determine possible tear of central slip defore the deformity is evident. Accurate anteroposterior and lateral radiographs of a digit is obtained. Sometimes the central tendon slip will be avulsed with a small fleck of bone from the epiphysis. The injury is easy to understand when this avulsion fracture is found. Commonly, in the child, the boutonniere injury may be accompanied by a fracture pulled off from the epiphysis. The amount of displacement of the tendon avulsion is easily comprehended if a bit of bone lies at the end of the central tendon slip. If acute, the object is simple: to keep the PIP joint in full extension during the healing period (6 weeks). The implementation, however, is difficult. If the PIP joint falls into flexion, the distance between the avulsed end of the central tendon slip and the insertion point on the epiphysis dorsally is more displaced, and the result will be compromised. It is also important that the DIP joint be allowed to flex actively and passively while the PIP joint is kept in extension. This allows for some excursion of both lateral bands by the injured central tendon slip and also allows excursion of the profundus tendon to prevent adhesions. It is almost impossible to keep the PIP joint in extension while the DIP joint is exercised. (4) ORIF of a bony avulsion fracture fragment if it is significantly displaced. This latter approach would be mandatory if the remaining portion of the middle phalanx were volarly dislocated. It is very tempting, if this injury is caused by an object such as a knife, especially over the PIP joint or the insertion point at the base of the middle phalanx, to openly repair this central tendon slip interruption.